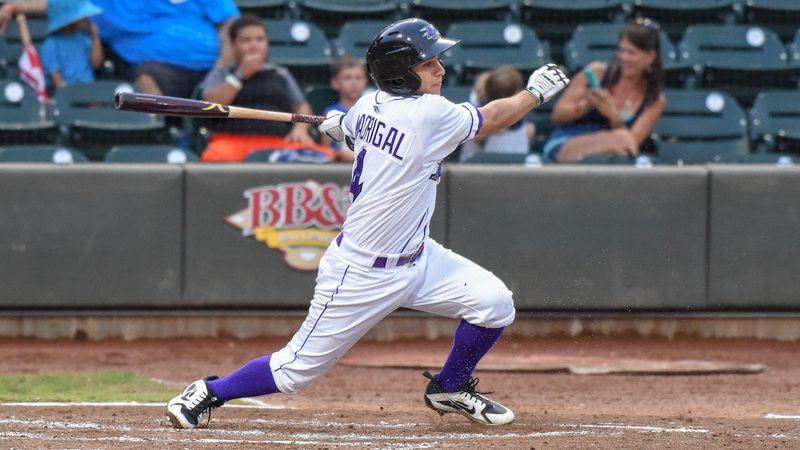 KINSTON, N.C. (Sept. 3, 2018) - Behind a career-high four hits from Nick Madrigal, Winston-Salem clinched a second-half Southern Division title with a 5-3 win over Down East on Monday afternoon at Grainger Stadium. After earning a first-half title on June 14, the Dash (43-25, 84-54) have won both halves for the first time since 2012, and the third time in the Dash era (2009-present). The Dash finish the second half with a 43-25 record, and finish the regular season 84-54, good for the best record in the Carolina League and the fourth-best record in all of Minor League Baseball. Winston-Salem plated a run in the top of the first inning against Wood Ducks (24-46, 59-81). With two outs, Madrigal singled to right, stole second base, and scored on an RBI single from Blake Rutherford. The Dash added a run in the third. Luis Gonzalez smacked a hard one-hopper to shortstop that kicked off Brendon Davis' glove and into left-center field, allowing Gonzalez to reach second with a double. Next, Madrigal reached first base on a bunt single, but Andretty Cordero's throw got by the first baseman Yanio Perez, allowing Gonzalez to trot home on the error to make it 2-0. Meanwhile, John Parke scattered seven hits over his first four innings of work, stranding six runners on base to keep the Woodies off the board until the fifth. Then, after a two-out walk and a hit-by-pitch, Perez crushed a home run over the left field fence to put Down East in front 3-2. Winston-Salem tied the game on the first pitch of the seventh inning when Gavin Sheets clobbered a solo home run to right field. The long ball is Sheets' sixth home run of the year. Then, the Dash jumped in front in the eighth against Kaleb Fontenot (2-3). After Madrigal doubled - his career-high fourth hit of the game - Rutheford lofted a single to left to plate Madrigal as the go-ahead run. Rutherford, who advanced to second on LeDarious Clark's throw home, went to third on an error by Brendon Davis and came in to score on a fielder's choice groundout from Sheets to make it a 5-3 game. Meanwhile, the Winston-Salem bullpen kept the Wood Ducks from scoring, as Danny Dopico, Blake Hickman (3-3), Mike Morrison and Tyler Johnson polished off the game by combining to throw four scoreless innings. Johnson fired a scoreless ninth inning to earn his seventh save with the Dash. With the regular season over, the Dash now begin their chase for a Mills Cup Championship. Winston-Salem's playoff run, presented by Pepsi and NCDOT, begins on Wednesday with a matchup against the Buies Creek Astros in the Southern Division Championship Series. After the first two games of the series in Buies Creek, Winston-Salem returns to BB&T Ballpark for Game 3 on Friday, September 7, with first pitch at 7 p.m. Prior to game three, a Food Truck Festival will take place at BB&T Ballpark starting at 5 p.m. If necessary, Games 4 and 5 of the Southern Division Championship Series will be hosted at the downtown facility. Game three will mark the first postseason contest at BB&T Ballpark since 2015. For tickets and more information, call the Dash at (336) 714-2287 or visit wsdash.com.